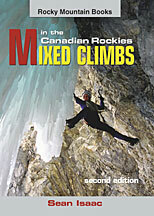 05/12/03: 2nd Edition of "Mixed Climbs in the Canadian Rockies"
The 2nd Edition of "Mixed Climbs in the Canadian Rockies", by Sean Isaac and published by Rocky Mountain Books, will be available in stores by the end of December 2003. In the three years since the inaugural edition, the number of mixed routes has almost doubled. The new volume contains nearly 300 routes ranging from M4 to M12. Whether you crave inverted dry tooling, multi-pitch horror shows or safely bolted moderates, this guide will have it all. Its 240 pages are packed with exciting photos and informative topos and maps. Order a copy on-line from Rocky Mountain Books.